Please Help Us Welcome Your Neighbors Home! 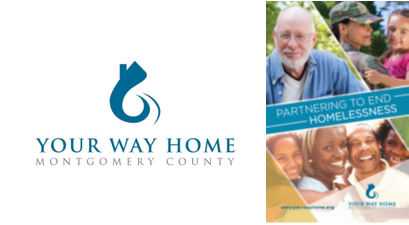 Your Way Home Montgomery County is a partnership of more than 40 philanthropic, nonprofit and community partners and government. Our vision is to make the experience of homelessness in Montgomery County rare, brief and non-recurring. We are accomplishing this bold goal by using proven strategies that tailor resources to each client’s needs, whether that is a small boost to get back on their feet or more intensive, longer-term support. Funds from foundations, businesses, organizations, and individuals fill gaps where public dollars cannot be used, like setting up new households for families and individuals transitioning from life on the street or in emergency shelter. Who are your homeless neighbors? They are families with children, single adults, veterans, women fleeing domestic abuse, medically frail seniors, LGBTQ, runaway and transitional age youth, and people struggling with mental and physical health needs. They are people who have lost jobs or who cannot find jobs that pay a living wage. Household basics. A big part of our work is setting up new households for families, youth, and individuals transitioning from shelter. Each year Your Way Home provides 300 safe, affordable apartments and basic household goods for re-housed clients, such as beds, sheets, dishes, pots and pans, personal care products, and pantry staples. We tailor the purchases to the needs of every household we help, and we work with local retailers, thrift stores, and nonprofits to source just the right items at prices that allow us to stretch each dollar as far as possible. Transportation assistance. Our clients use public transit for work, school, housing counseling, child care, food shopping and laundry, and health and other appointments.